This is the best hangover ever! My idea for getting coats and bags, scarves and hats, off of the floor and dining table is finally on the wall. Maybe my resolution for this new year should be learn new things! I knew I would need help getting the coat hooks on the wall properly. 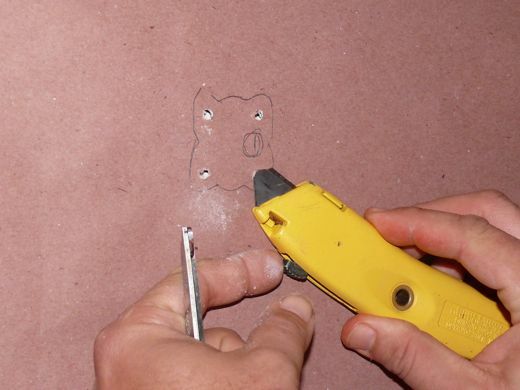 It's no good using nails, or my go-to method: Hot glue! So, I turned to my dear, and asked him to show me how it's done. 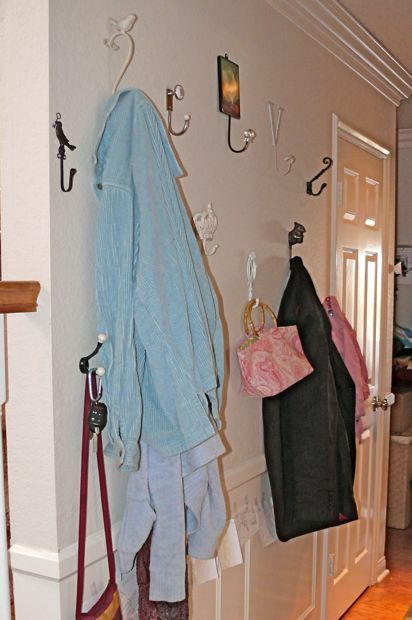 And I am not alone in this quest for learning... my friend Judy asked me to share what I learned about hanging coat hooks. Judy, I took pictures, and I took notes, and just to prove that I really was paying attention: I am going to hang more hooks in the bathrooms, and our bedroom, and I am going to do it all by myself. Maybe my resolution for this new year should be take initiative! 4. 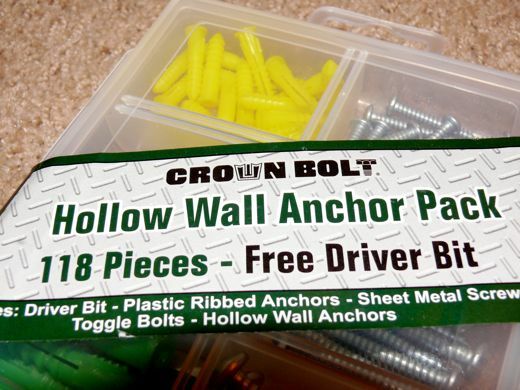 Screws, which are often matched in the box of anchors, so: Convenient! Okay. 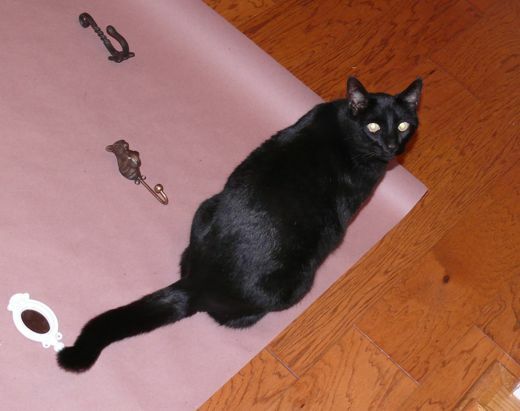 If you are not putting up a bunch of hooks, then you can probably skip this layout part. If you want to map out your plan, or ensure that you get a straight and even row of hooks, then get some straight and even paper. We spent some time playing around with the layout, which is meant to look appealing, yet random. Or was it random, yet appealing? 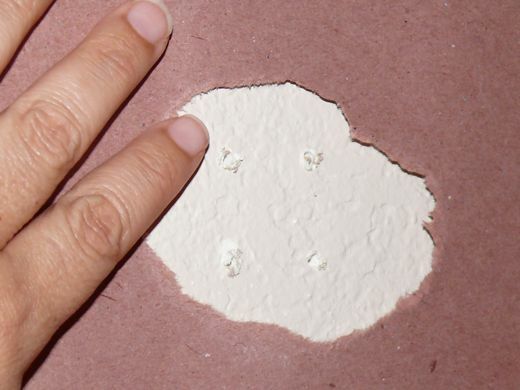 The paper is cut to the same width as the wall where we are putting up the hooks. If you can, get more than one opinion. Chango was indifferent to this layout, so we moved the squirrel a little closer to the bottom. I think it was a good choice. The decisions are made. 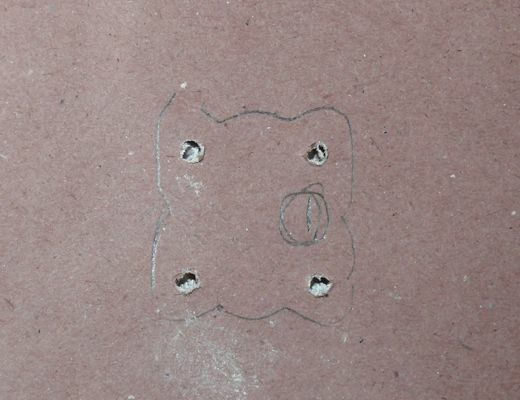 The hooks are where we want them to be, and so Geoff marked each screw hole, and traced the hardware in its place. For extra certainty he named each hook and wrote that name next to the marks for the screw holes. Elaborate, but we had a lot of different hooks. 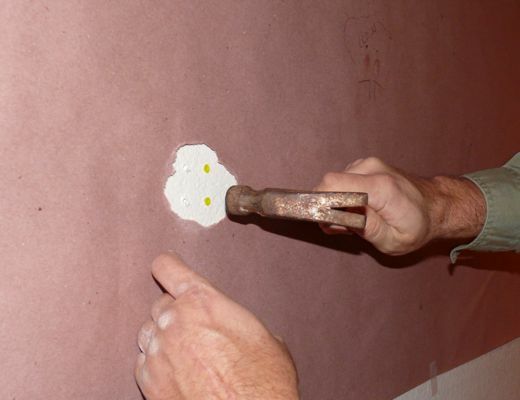 Once every hook was accounted for and traced on the paper, we hung the paper in place on the wall where we were putting the coat hooks. Geoff brought out a level and adjusted the top of the paper, then we taped the paper in place. Select the screws you will use to put up your hook. 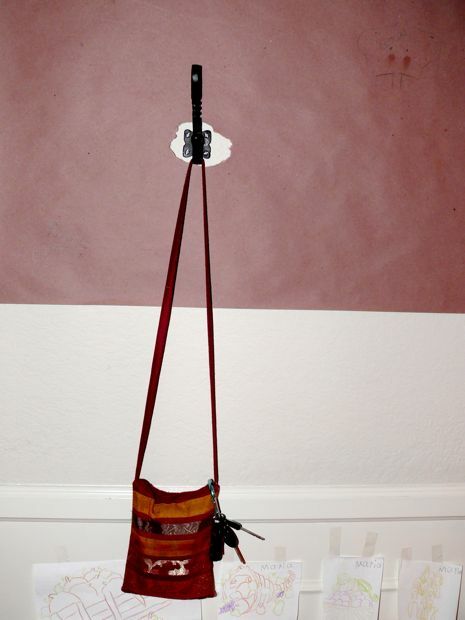 We were eager to do the job, and not eager to go to the hardware store, so we did not use matching screws... I may dab dark nail polish on them, if I ever become concerned about the screws matching the coat hooks, which I am not. Okay. We have the screws we will be using, now we fit them with one of those hollow, plastic anchors... the metal screw is going to be turned in the anchor, and it needs to be a nice tight fit. If the anchor is too big, it will not hold the screw in place, and our coat hook will wiggle and turn, and eventually drop to the floor. These are oh-so useful, and yes, fun. Seriously, when you get comfortable with a power tool, it is liberating and fun to realize how much easier and faster jobs can be. 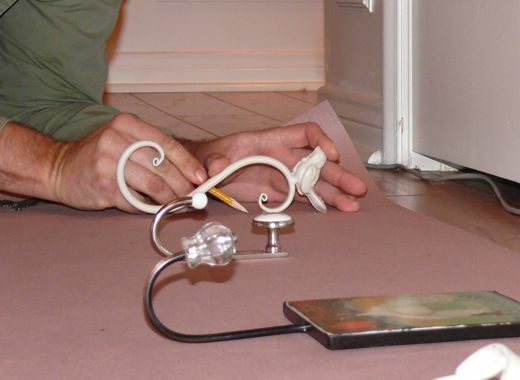 It is very worthwhile to get comfortable with power drills and screwdrivers. Geoff chose a drill bit slightly smaller than the anchors we are using. 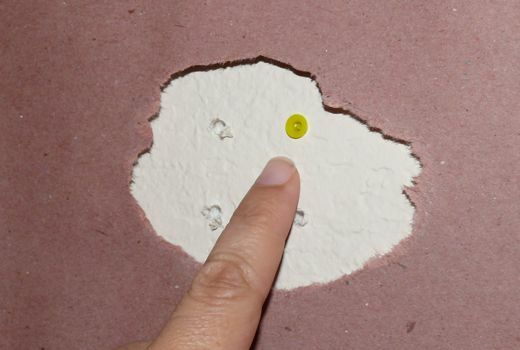 You can imagine that if the hole is bigger than the anchor then there will be no wall for the anchor to grip, right? I am actually looking forward to trying this on my own. Geoff took this part, the drilling, slowly. He drilled cautiously feeling for studs. 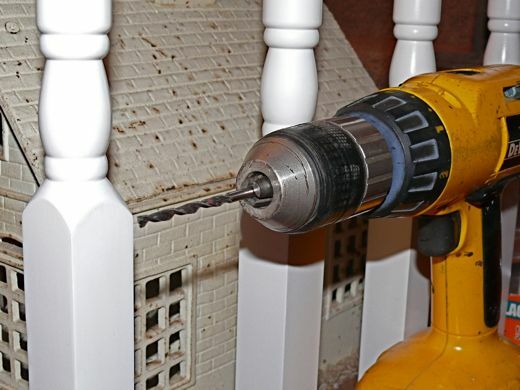 If the drill bit hit wood, then he knew that he could skip the anchor part, or simply shorten the tip of the anchor, so that it only extended through the drywall. The shortened anchor would still secure the screw, and the wood would definitely do the rest of the job of keeping the screw from spinning. Hook one, with it's four holes marked and drilled. 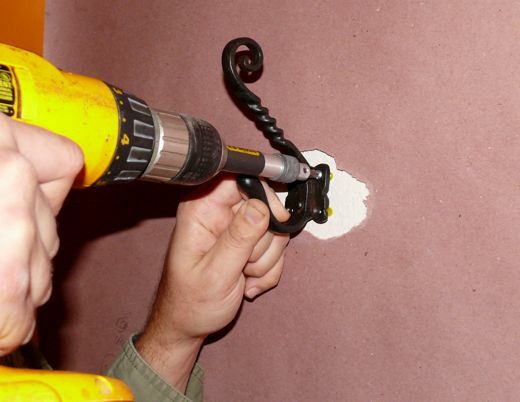 Geoff liked to gently tap them flush with the drywall. Power tools are versatile. 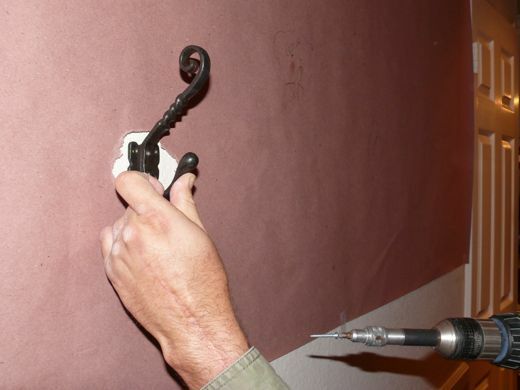 First it was a drill, and by changing from a drill bit to a screw bit... we are ready to drive the screws in to the anchors, which are in the drywall. It's so cool that the screw bit is magnetized. Can you see that the screw is attached to the screw bit? Very convenient. They're in, and the coat hook is up, and ready! This is how we spent my birthday. And I also made crispy tacos, so, you know... it was pretty much awesome. It's only been two days, and I have already seen coats and scarves, bags, goodies... all varieties of hungover articles on our wall of order. It's marvelous. It's random, and appealing. I feel a new degree of optimism and hope, like anything is possible. And did I mention? My oven works! Three times is the charm. Hooks, oven, new skills! Maybe my resolution for the new year should be never give up, never surrender! I love it! Great tutorial. And a belated Happy Birthday/Happy New Year. I love it, Natalie! Great job on the 'random and appealing' look! I like how you used the paper to make the placements on the wall! Truly inspiring. The finished product looks fantastic! Oh Natalie, you are amazing!!! LOL I love the placement of your hooks, and your instructions were just mah-velous. 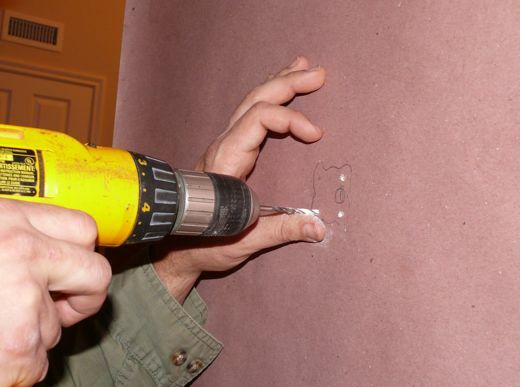 If I had drywall walls, I would have no problem following along, but I have very thin luan walls, as in old house trailer ... so I always have to use screws, but without the anchors. Have a magnificent New Year. OMG! I have the exact same cream-colored bird hook by the back door, used for dog leashes, my coat, and the flashlight (so I can find my way to the coop after dark). Love it! It also makes me feel like a celebrity when I see something I have somewhere else. Fabulous news all around: hooks, over, birthday, New Year. 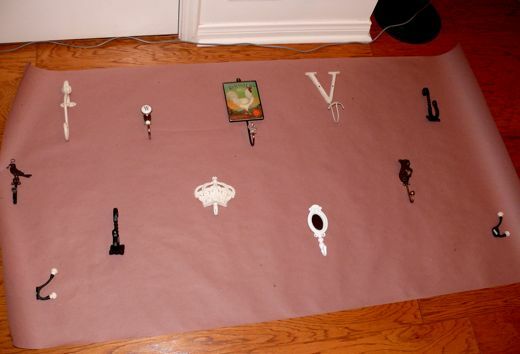 You did a great job installing the hooks, and your hook collection is beautiful! Em... thank you... Geoff had all the ideas, but I am prepared to take lead now. Nikkipolani... ah, thank you. I love that I have a quick and easy remedy for putting things away. Yvette... so do the screws hold? Many thanks for your praise. Kara... 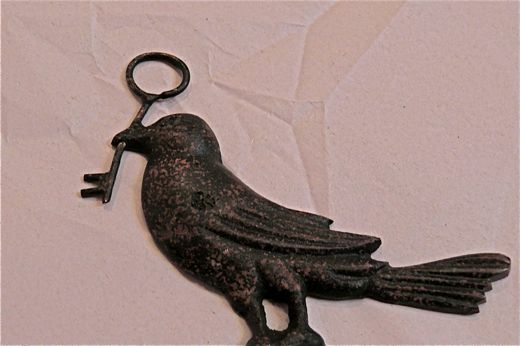 I was trying to remember where I found the bird hook, and think it came from a little gift shop near the beach... one of those dangerous places, where I know I will find something I like, but she has fair prices, so *yay! * We are both celebrities! La-de-da! I hope we all enjoy minor and major triumphs in this new year! Love it, Natalie! Absolutely LOVE it! Spent part of the afternoon putting new knobs on my kitchen and bathroom cabinets. Don't you just love the little touches? 'A Wall of Order'!! Wow - I am going to have one in our new home. What a wonderful description. Thank you so much for the tutorial, Natalie, and thank Geoff too! This is going to change my life for sure. Your hooks look great! Thanks so much for sharing this tutorial. I have been contemplating doing something like this for the longest time. Thanks for the motivation:) It looks great and unique! Wow. This is truly a guy who knows how to do things the right way! I'm in awe -- we'd have totally blown in had we attempted such an undertaking without such expert guidance. Can't wait to see how you now put your new top-drawer skills into action, and I hope the hooks remain filled with things that aren't being left elsewhere! Wow! That is so much work! And on your birthday! Happy Birthday to you! Chango! Do you gets your own hook? What a fantastic looking wall! For some reason this reminds me of Mary Poppins but I'm not exactly sure why. Cheers!